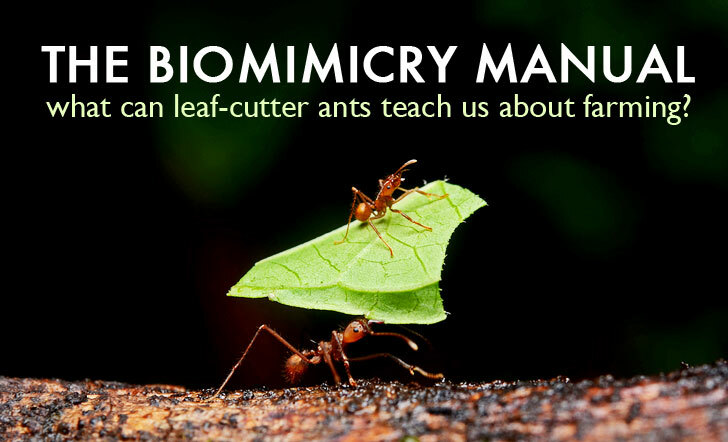 The Biomimicry Manual: What Can Leaf-Cutter Ants Teach Us About Food Systems? About twelve thousand years ago, humans hit on a bright idea. Why not grow food in our backyards instead of having to go look for it every time our tummies grumble? It was a masterful stroke of conscious evolution, but hardly a new one. Leaf-cutter ants tapped into sustainable agriculture some 50 million years before us. These busy little beasts spend their days harvesting leaves and trucking them, one-by-one, down, in the ground, to get out, of the rain. Boom boom. But instead of eating the leaves, leaf-cutters masticate them into a thick fluffy paste, spit it into their special growrooms, and fertilize it with their own feces. Before long, the domesticated fungus they adore sprouts forth. These hard-working farmers even evolved fungicides to keep marauding non-edible mushrooms out. Humans farms are pretty fantastic too. Somehow, we manage to feed the vast bloom of global humanity (more or less). But our agricultural techniques require endless inputs: water from far away, petroleum-intensive fertilizers and pesticides that accumulate in our water, soil, and bodies. Meanwhile, the endless rows of identical corn and wheat are dangerously vulnerable to climate change, and glaringly obvious to insects that want to eat them. What can we learn from nature about sustainable farming? Find out in today’s entry of The Biomimicry Manual! WWI is considered by many to be the dawn of the chemical revolution. That’s when we realized we could really kill a lot of things simply by blasting poison at them. Since then, we’ve gotten ourselves stuck on a “pesticide treadmill.” Insects attack our crops (which are incredibly hard to miss because there’s miles and miles of them and nothing else), so we spray the bejeezus out of them with killer chemicals. Most of them die, but some squeak through to pass on their chemical-resistant genes to the next generation, requiring us to come up with nastier ‘cides. Rinse and repeat ad infinitem, until we poison ourselves and every living thing on earth to death. Mission accomplished: we’re using 3,300% more pesticides since WWI, but the damn bugs just keep on eating. Humans cultivate some 30,000 edible plants today, but mostly we eat only twenty of those. All are are annuals, meaning, “weedy species that take advantage of bare ground and work fast to make seeds and die.” Over half our calories come from just three of these quickie crops: wheat, rice, and corn. All of humanity is counting on just these, and the UN says two-thirds of the seeds planted in developing countries are “unified strains” with almost no genetic diversity. Geneva…we have a problem. As a species, we’ve built a food system where we are wholly dependent on a handful of identical crops. What if the weather changes? Mother Nature can tell you that betting on things to stay exactly the same is a surefire recipe for a catastrophe when disaster strikes—and it eventually always does. On the windswept American prairies that came before those endless acres of cornfields, diversity was nature’s best defense. Genetic variation within any species is an insurance policy. When your seeds are essentially clones, a single disease or cold front or drought can wipe you out. But if you’re trying a little of this and a little of that, some of your guys will make it. Fly like a butterfly, sting like a bee— it keeps your enemy confused. A diversity of plant species also works for overall ecosystem productivity. Something is always blooming, sprouting or dying, leaving very little open space for weeds, and shooting out a crazy-quilt of scents and signals for insects to find or avoid. Diversity truly is the cheapest and best pest control. Prairie diversity boosts productivity in other ways too. Each species has a different root depth, capturing nutrients and water under different conditions. When they do, those inputs are put back into the system. The rich get richer. If you visit a freshly plowed Kansas wheat field during a spring rainstorm, you will see muddy water streaming off the fields. In just 200 years, a third of our valuable topsoil has gone out to sea. But the wild prairie never gets plowed under: the root system stays intact all year, and soil stays put. The whole thing is like a giant sponge, soaking up rainwater for, well, not a rainy day, but the inevitable summer drought. Prairies have 88 times less run-off than our fields, and deep taproots draw moisture and nutrients all the way down. And fungus! An underground network of “mycorrhizae” (mushroom roots) nestles around the plant roots, plugging every plant into a superhighway of water and nutrients, increasing water-storing capacity ten to a hundred fold. It’s like googling for information instead of randomly taking books off the shelf. It just works better. The Land Institute (TLI) in Salinas, Kansas is a revolutionary research farm trying to create a whole new approach to agriculture by farming like a prairie: they maintain a mix of deep-rooted edible perennial “crops” from year to year, instead of planting and replanting ‘weedy’ annuals. 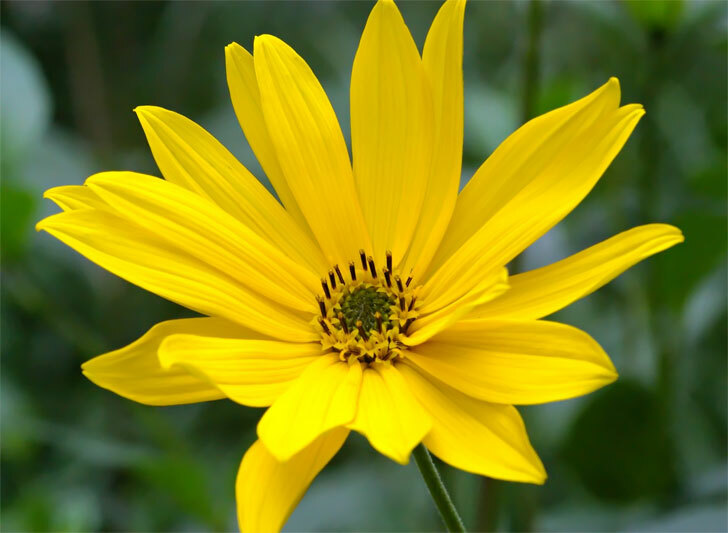 TLI uses mammoth wild-rye and Maximilian sunflowers, nitrogen-fixing legumes like cool-season Illinois bundleflower and warm-season eastern gamma grass, grain crops, and natural insecticide producers. These are reasonably yummy substitutes for wheat and corn. Gamma grass seeds, for instance, are large and protein-rich (30% protein and 7% fat), and make a flour not too different from cornmeal. On the prairie, legumes fix nitrogen naturally. Their roots attract and host an entire microbial and fungal ecosystem that does it for free. Other critters, like earthworms, microbes, fungus, and other creepy-crawlies, help recycle important nutrients like phosphorus, potassium, and manganese, while adding their own organic fertilizer to the mix. We could use their services gratis! Oh but wait, we’re on that chemical treadmill. We scorched and blasted those little guys into oblivion, pretty much killing our agricultural land. You can’t surf for free if nobody else is surfing. So, we have to do the heavy lifting all ourselves: more and more of those expensive synthetic fertilizers (which use almost twice as much fossil fuel to make than all our tractors and farm equipment combined, and end up in our waterways), labor, and equipment. Seems kind of silly, doesn’t it? Why work this hard to make things worse? The Land Institute likes free stuff. Freedom from chemical fertilizers, herbicides, and pesticides means big savings in labor and input costs. Replacing annual grains with perennials that don’t require annual tilling and replanting would eliminate half the soil erosion in the United States, saving $20 billion worth of U.S. soil, and $9 billion in fuel. Perennial polyculture means fewer chemicals that harm our health, less dependence on fossil fuel (for farming equipment, global shipping, and fertilizers and pesticides). It’s productive, resilient, self-fertilizing, self-weeding, and it improves the soil. But can perennial grains yield as well as our traditional annuals do? With yields ranging from 1,500–2000 kg/ha in an area where Kansas winter wheat is produced at 1960 kg/ha, The Land Institute’s research says yes. If there’s one thing biologists know, its that every ecosystem and habitat is unique, with different challenges and adaptations for dealing with them. We can’t “farm like a prairie” everywhere. Not everywhere is a prairie. But if we pay attention to what grows wild on each particular piece of land, how the native plants and critters make a living in that place, we can farm the way nature farms. We can surf for free, adding richness to the system instead of depleting it. 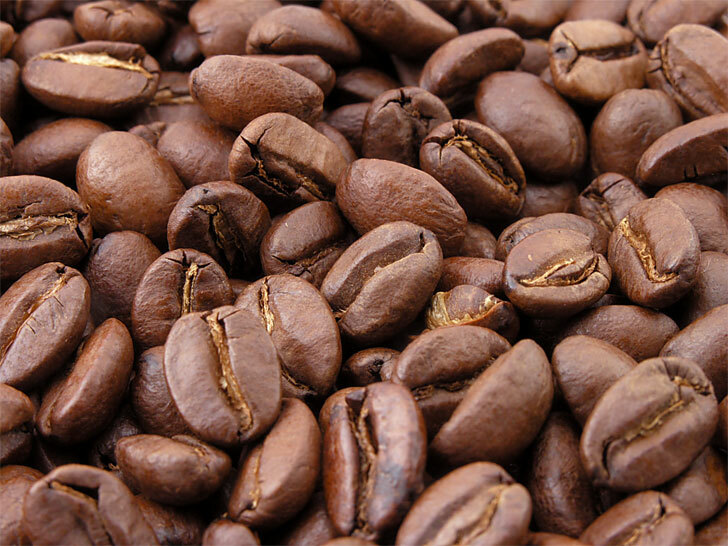 Coffee plantations in Colombia, for instance, are tapping into local tropical and soil ecosystems by growing lucrative shiitake mushrooms on their “waste” mulch, and anything left over is used as animal feed. It’s an ecosystem. Even in cities, we can tap into the way nature farms: The Vertical Farm Project, for example, uses hydroponic techniques to imitate bromeliad flowers, which capture water, attract other organisms, and form a lively and productive ecosystem. Our industrial precision is designed to remove the unknowns so we can scale things up massively without confusing folks. But sometimes those unknowns are really important. We forget that everything is connected, and in a complex system, one and one is often more than two. The creatures that evolved on the prairie “surf for free” on the “waste” and skills of one another. The result is more for everyone, and much of the inputs are free! Maybe it’s too complex for us, but I doubt it. “Free” is usually worth the trouble. Leaf-cutter ants moving across a rope. 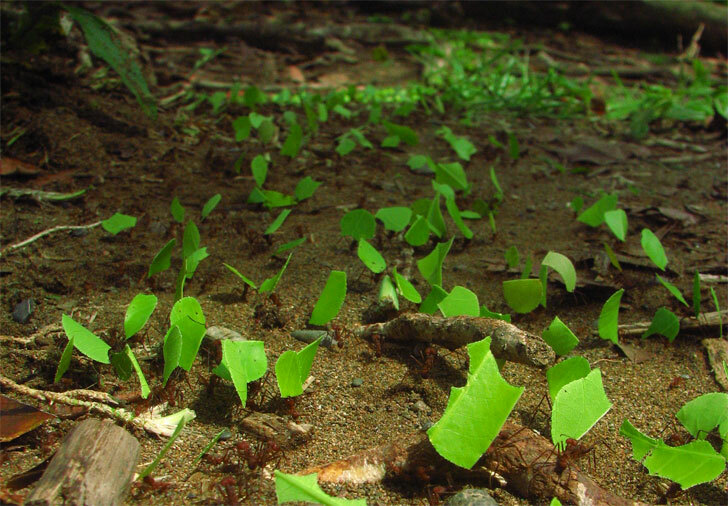 Close-up of leaf-cutter ants transporting leaves. Leaf-cutter ants climbing. The stronger of the two carries the leaf. 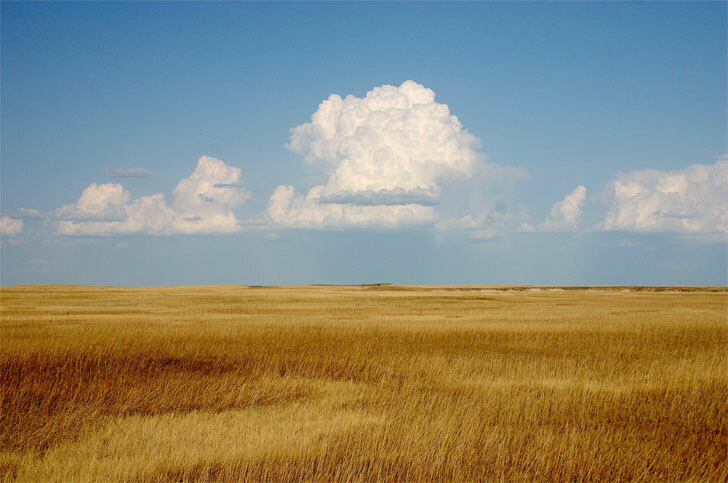 Cumulus clouds over a yellow prairie.